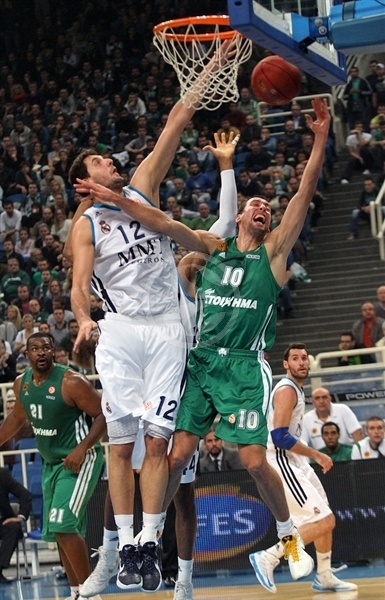 Panathinaikos Athens snapped its two-game losing streak by downing Real Madrid 79-68 in OAKA Arena on Thursday night. Panathinaikos also holds a potential tiebreaker over Madrid due the 11-point margin of victory, which is greater than its loss in Madrid. The Greens now sport a 3-3 record for tie for third-place with Fenerbahce Ulker in Group A, while Real Madrid drops to 4-2, but remains tied atop of the group. Panathinaikos used an 11-0 run midway through the second quarter to open up a double-digit advantage and never looked back as visitors never got closer than 7 rest of the way. Stephane Lasme led the way with 15 points plus 8 rebounds and Andy Panko scored 14 in the victory. Jonas Maciulis finished with 12 points while Roko Ukic chipped in with 11. Carlos Suarez paced Los Blancos with 16 points on 4-for-4 three-point shooting. Jaycee Carroll added 9 and Sergio Llull 8 in defeat. 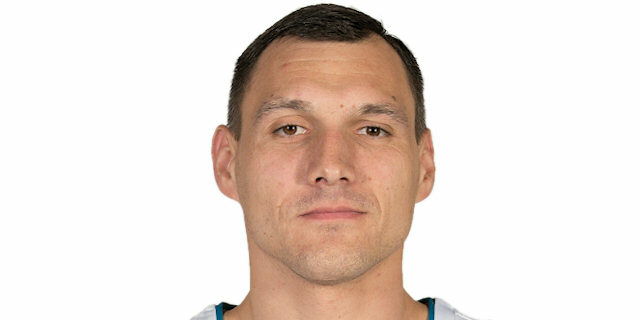 Mirza Begic got the game going with a hook shot on the opening possession while Panathinaikos struggled early as Jonas Maciulis put-back was hosts’ lone field goal on their first six shots. A Nikola Mirotic triple made it 2-7 before Ukic drove the lane on back-to-back possessions to tie it at 7-7. Madrid immediately got back in front after Begic answered with a jumper, while Suarez and Mirotic each scored from downtown to help open up 9-16 lead. However the visitors failed to score a field goal in the final three minutes of the quarter and Greens went to the foul line cutting it to 12-16 at the end of first quarter. Lasme’s put-back got Greens going in the second quarter and sparked a run capped by Michael Bramos’s fastbreak dunk for an 18-16 lead. Martynas Pocius answered from downtown, but a triple from Derwin Kitchen and couple of easy fastbreak buckets from Andy Panko and Kitchen gave the hosts a 25-21 advantage. Madrid answered with another triple, this time from Sergio Rodriguez, however the hosts stiffened up on defense and Panko scored a layup-plus-foul to spark an 11-0 run that included easy layups from Maciulis and Lasme, as well as Maciulis’s basket-plus-foul for a 38-26 advantage. 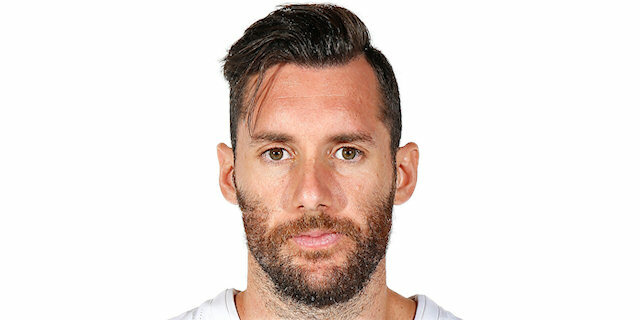 Suarez hit back-to-back three-pointers to snap the run, and after Dimitris Diamantidis scored his first points of the game, Rudy Fernandez hit from downtown as time expired to make it 42-35 at the half. 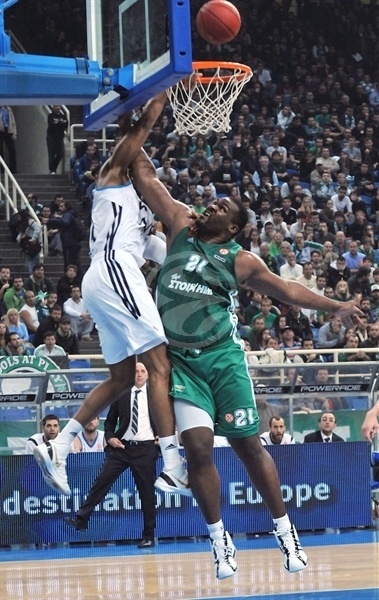 Panathinaikos continued to be a more aggressive side after the break. After Begic scored from close range, the Greens answered with 9 straight points including a Bramos triple and layups from Maciulis and Sofoklis Schortsanitis extending lead to 51-37. Dontaye Draper snapped the run with a three and Suarez, Carroll and Marcus Slaughter scored inside to keep the visitors in range, but Ukic hit a floater and a triple and a basket-plus-foul from Diamantidis made it 61-46. Slaughter and Pocius cut it to 11 points, but Lasme hit a layup and a pair of free throws to give Panathinaikos a 65-52 advantage going into the fourth quarter. Suarez hit his fourth three-pointer of the game before Kitchen hit a jumper and a fastbreak layup for 69-55. However, Felipe Reyes hit a pair of free throws and Llull converted a three-point play to give Madrid hope. Carroll sank a triple for 71-64. However, Lasme had couple of dunks on both sides of Carroll’s triple and Panko made a floater and a jumper to push the margin back to 13 points and seal the deal. Reyes and Carroll brought the deficit briefly back into single digits once again, but it was too little, too late as Panathinaikos and its fans were already celebrating a big win. "We played with great energy, especially in defense and I want to mention that our fans helped us to find and keep that spirit. All the players knew how important the game was and kept their concentration. Through the aggressive defense we ran in the open court, scored some easy points and got the momentum needed. We committed less turnovers than we usually make and also grabbed more boards than Real, which is the Euroleague's leading team in the rebounds. In such a case the desire counts more than the ability. There is no doubt that we have to fight against the pressure and I am optimistic that something good is under construction over here. The glorious history and the successes of the team are on our shoulders and we are trying to handle with this. 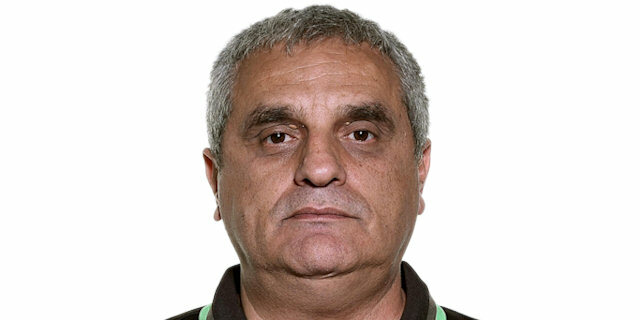 Everybody has to understand that Panathinaikos has changed the page in its book and we have a totally new team, which learns a lot from every game." "Congratulations to Panathinaikos for their victory, because they played a very good game. Although we got an early 7-point lead, we didn't play the right way. 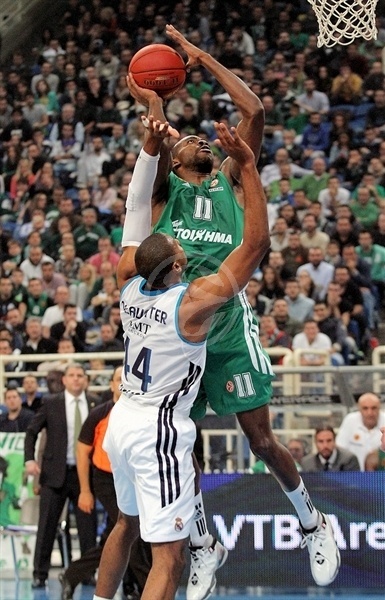 Panathinaikos played with more passion and heart. Desire and passion are always the keys to win a game. Regarding our team, we got some lessons tonight. We played the worst game so far in the season. We knew that the group would be tough and many things can happen in the four remaining games." "It was a tough game, because of the standings and the two consecutive defeats we have suffered. We worked hard at the last practices and that paid off. Tonight we played great defense and our physical game was very effective. We didn' t hesitate in our decisions, as it has happened in the previous games and now we are in a better position. Everything is mixed up in the group now and we will try for any possible win." "We played bad and Panathinaikos had a fair win. Fortunately we keep our togetherness and I am sure that we will learn useful things from this game."